Minneapolis, MN – With Super Bowl LII three days away, dozens of community members blockaded the streets around Minneapolis Mayor Jacob Frey’s condo to implore the mayor to divest resources from the police and invest into communities. Protesters dropped a banner that read “Frey, Cops ≠ Safety” and left signs encouraging police divestment in front of Frey’s residence. No arrests were made. During rush hour traffic in one of the busiest intersections in Northeast Minneapolis, two rented vans parked into a ‘V’ shape on Hennepin Avenue blocking traffic from University Avenue. Two more vans blocked traffic on 4th St. while marshals in vests formed a soft blockade and directed traffic on University Ave and Surdyk’s parking lot. A bus driver for Metro Transit briefly attempted to drive through the crowd on University Ave. as he yelled through the window for people to move. The marshals told him to re-route his bus one block and that they weren’t going to move. The bus driver called the police, then parked the bus in the middle of University Ave, facing northeast, bringing traffic to a standstill. Standing around signs saying “Divest From Police – Invest in Us” and “How the City Spends our Tax Dollars – $179 million on Police, $15 million on Affordable Housing“, activists rapped divestment messages over hip-hop beats and chanted for divestment while some danced and others blocked traffic. Police arrived to the blockaded intersection about twenty minutes after the action started, spoke with some of the protesters, and redirected traffic. The bus was then re-routed and higher ranking Minneapolis Police officers descended on the scene. The day before, on Wednesday, January 31, a rent strike action happened in South Minneapolis, where renters from long disputed rental properties of the Apartment Shop stopped paying rent to the landlord. The strike was organized by Inquilinxs Unidxs por Justicia (United Renters for Justice), a “group by renters for renters in Minneapolis, MN to create better housing in our city“. The police divestment action at Jacob Frey’s residence was just the latest in a long line of recent protests against police brutality. The Twin Cities have seen many high profile police killings in the last several years. Protest movements grew out of the police killings of Fong Lee, Terrance Franklin, Marcus Golden, Phil Quinn, Jamar Clark (which led to the 18-day long protest encampment at the 4th Precinct), Michael Kirvelay, Philando Castile (which led to 20-days of protest at and around the Governor’s mansion), Cordale Handy, Justine Damond, and many more. Many of the killings have been by the St. Paul Police Department, which prompted Black Lives Matter Minnesota to issue a travel alert on February 1, warning people of color to “exercise caution” when traveling to St. Paul. 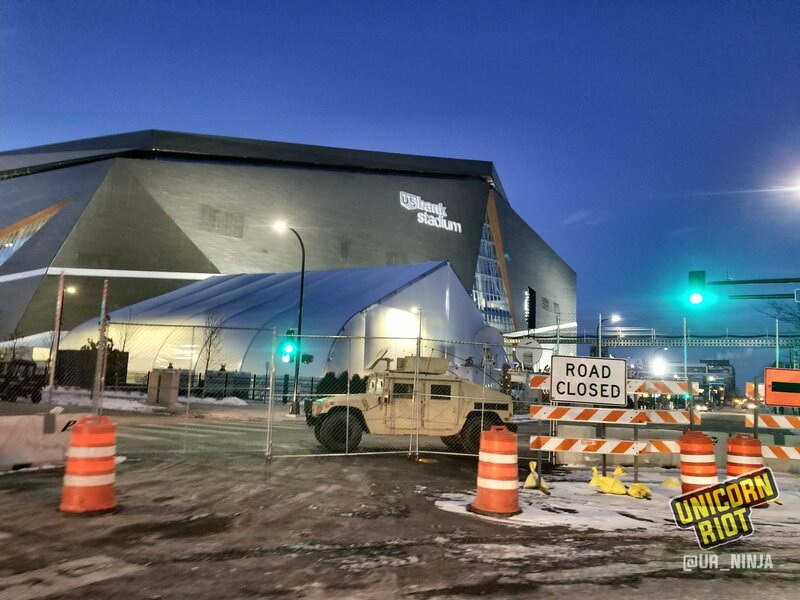 With Super Bowl LII in town, Minnesota is in the middle of its largest security operation in history. There are still several protests planned for Friday and this weekend as well as the two-day Take a Knee Conference.